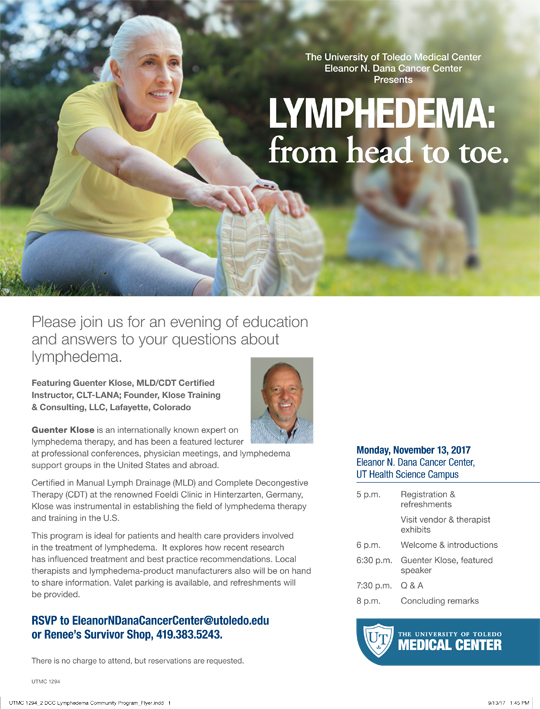 The Eleanor N. Dana Cancer Center is hosting “Lymphedema: From Head to Toe,” an evening of education and answers about lymphedema, Monday, Nov. 13. Registration will begin at 5 p.m. with the free program starting at 6 p.m.
Guenter Klose, founder of Klose Training & Consulting LLC in Lafayette, Colo., will be the featured speaker. Klose is an internationally known expert on lymphedema therapy. Certified in manual lymph drainage and complete decongestive therapy at the renowned Foeldi Clinic in Hinterzarten, Germany, Klose was instrumental in establishing the field of lymphedema therapy and training in the United States. In addition, local therapists and lymphedema-product manufacturers will be on hand to share information. Valet parking is available, and refreshments will be provided. Those interested in attending are asked to RSVP to eleanorndanacancercenter@utoledo.edu or Renee’s Survivor Shop at 419.383.5243. This entry was posted on Wednesday, November 8th, 2017 at 3:09 am and is filed under Events, UT Health, UTMC, UToday .